Looking at a picture of a peaceful, elegant swan puts me in a pensive mood. I’ve made a PowerPoint of works by an artist called Stuchie. He is a minister who says art is artistic therapy for him. I want to do this project with the 3rd grade, but the classroom doesn’t have the equipment to show the PowerPoint, so I picked out one picture to make an example and will have the kids make a swan picture. We’re using oil pastels on black paper for this project. 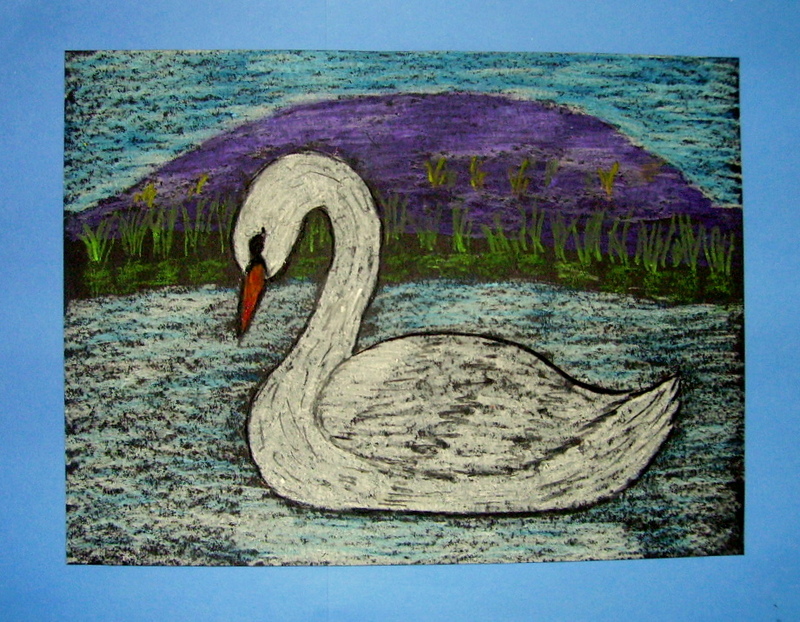 Draw the swan on the black paper with white oil pastel or chalk. Or,— I have included a rough sketch of a swan for anyone who wants a bit of help making a sample. I colored the back of the sketch with white crayon and used a stylus (old ball point pen) to trace the swan on my black paper. The PowerPoint takes about a minute to load. The directions for this project, “Swan Lake,” can be found in the 3rd Grade Projects Gallery in the sidebar. This entry was posted in 3rd Grade and tagged 3rd Grade, art projects for children to make, art with swans, arts and crafts for kids, easy way to draw swans, oil pastel on black paper art project, oil pastels, stuchie, swan, swan lake. Bookmark the permalink.